The weekend’s rejuvenated Adelaide Festival of Ideas has thrown up a challenging central idea about the culture of South Australia, with festival founder and public sector executive Greg Mackie raising questions about time-wasting, politicisation and a lack of external focus in the public service. In the Bettison and James Oration delivered yesterday, Mackie – a senior public servant through the Rann years and now CEO of the statutory authority, the History Trust – questioned why many of the ideas-focused entities built during the Rann era had been since dismantled under Premier Jay Weatherill. Mackie, who was deputy and head of the Department of Premier and Cabinet under Mike Rann, says the late Rann years felt like “something of a golden age” in relation to the cultivation of ideas. As evidence he cited the then biennial Festival of Ideas (later de-funded by the Weatherill Government), the Thinkers in Residence program (also scrapped), and the now defunct Integrated Design Commission. After Rann was replaced by Weatherill in 2011 and, soon after, Mackie moved to another part of the public sector, the Department of Premier and Cabinet left its old role as an “ideas crucible” to become a “service centre” for the South Australian public sector. “Rightly or wrongly it felt to me as though thinking and ideas were no longer valued, and the past was no longer something upon which to build new legacies,” Mackie said. Mackie said before he left DPC, he had developed an idea for a web portal called “Thinking Adelaide”, which was to be a one-stop-shop for all organisations and events that encouraged the generation of ideas in South Australia. The concept was also designed with a broader purpose – to build a kind of loose alumni association for all of the international guests that had contributed to the Festival of Ideas over many years, to encourage these people to become champions of Adelaide as a place where ideas were valued and generated. “Thinking Adelaide has withered and with that I believe an incredibly powerful set of connections and opportunities…,” Mackie said. He went on to criticise a culture of time-wasting which gripped South Australia’s public sector – and argued that it works against the kind of collaboration he wanted to encourage. “One of the things we tell ourselves here is that Adelaide and South Australia is a great place to collaborate – after all it’s seemingly easy to get, quote, ‘the right people’, unquote, around a table at reasonably short notice. And we tell ourselves that this means we do collaboration better. Wrong. Totally wrong. “The urbanist and former Adelaide Thinker-in-Residence , creative industries expert Charles Landry, concluded of Adelaide that we fall victim to confusing conversation with collaboration. 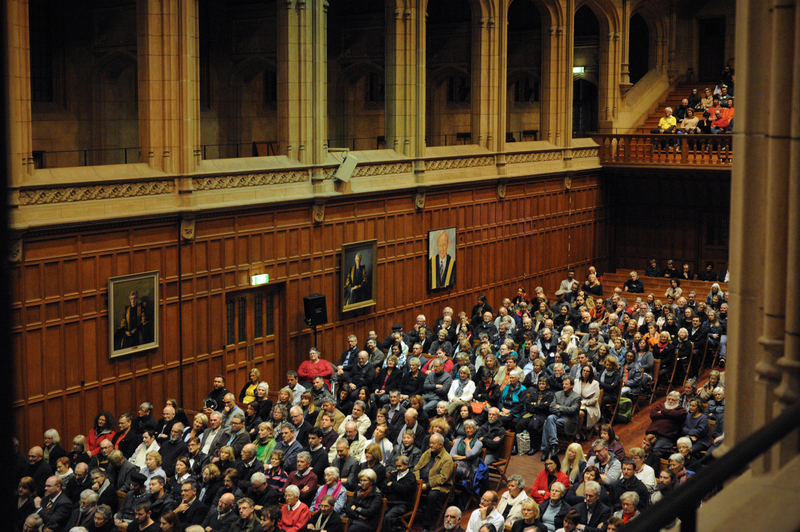 “Adelaide’s very much a public sector town and as such we’ve turned meetings into a pathology. And I posit that the reason for this is that we place too little value on that most precious and scarce of resources – time. “Like frogs in a pot of water warming slowly on the benchtop, we squander time as though it has no value. “We make meetings with no sense of clear purpose, we invite more people than we need to those meetings, with no regard to the authorizing environment and hierarchies needed to make a collaboration happen. And we squander valuable time that might otherwise be put to more productive use or that might, dare I say it, otherwise save the taxpayer hard-earned money. However, he said the capacity to nurture international friendships and convert visiting “thinkers” into champions for SA was being stymied by the public sector. South Australia did not focus on the value of external relationships. “What I’m proposing is to adopt a mantra in South Australia of better cultivating and sustaining relationships with thought leaders that we bring into our local communion… and that we convert these people… into champions and advocates of our shared mission. Mackie’s criticisms come in the midst of Weatherill’s own festival of democracy – dubbed Open State – which is designed to encourage “collaboration, innovation, ideas and enterprise”. The Festival of Ideas has been promoted as part of Open State. InDaily has asked the Premier’s office for a response to Mackie’s criticisms, but Weatherill has made it clear in the past that his approach to cultivating ideas is vastly different to Rann’s. Writing for InDaily last year, Weatherill said that ideas about enriching people’s lives “should not be the sole province of academic, cultural or even political elites” and that everyday people needed more of a say. “Too often we have outsourced the responsibility for ‘big ideas’ or ‘solutions to big problems’ to experts,” Weatherill wrote. “Too often those same ideas fail because, rightly or wrongly, they suffer from a perception of being grounded in an intellectual pursuit rather than an authentic effort to improve people’s lives. Mackie’s Festival of Ideas made a return on the weekend after a three-year absence with limited government support, instead relying on corporate support, backing from all three local universities, and the work of volunteers. The truncated festival attracted about 15,000 people, compared to 30,000 in 2013. However, the organisers are still well-pleased, pointing out that this year’s festival was a full day and evening shorter than the previous government-supported version, and also made do without an advertising budget. Mackie, who is pushing for the festival to become an annual fixture, said he was thrilled by the public’s response. “This is a total vindication of our effort and belief that AfoI deserves to have a future,” he said. Podcasts of the festival’s sessions – including talks by Erin Brockovich, Barry Jones and Phillip Adams – can be found on the festival website. InDaily was the digital media partner of this year’s festival.